Recently I had the opportunity to spend some time doing one of my favourite things: spending time on my own in the bush (with my camera of course) I had recently passed through the Border Ranges area and thought there were some promising opportunities for photos and it is only about 90 minutes from home so off I went. The Border Ranges National park is located in the northern rivers region of New South Wales on the rim of the Mt Warning caldera and adjoins Lamington National Park. 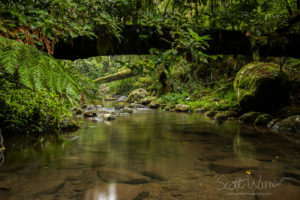 It is a beautiful rainforest area with many clear flowing creeks, rocky outcrops and spectacular view over Mt Warning towards Byron Bay and the coast. I had a late start from home and arrived in the late afternoon which I spent driving around and orienting myself to the park. I visited a few of the main features but didn’t take many photos due to continual wind and rain. Being on the edge of an escarpment so near the coast the park generates a lot of cloud and with a low pressure front heading towards the area I wasn’t hopeful for any fine weather but thought I would wait and see what the next day would bring. The rain continued throught the night and I was glad I was camping in the back of my Subaru rather than in a tent as I was nice and dry with no wind buffeting me around. I had already decided that Brindle creek would be my first photographic foray and heading off early in the morning. Unfortunately the weather had not really improved so taking photos was a delicate juggle of umbrellas, rain covers and ground sheets but I spent about 5 hours exploring the tracks along the creek. 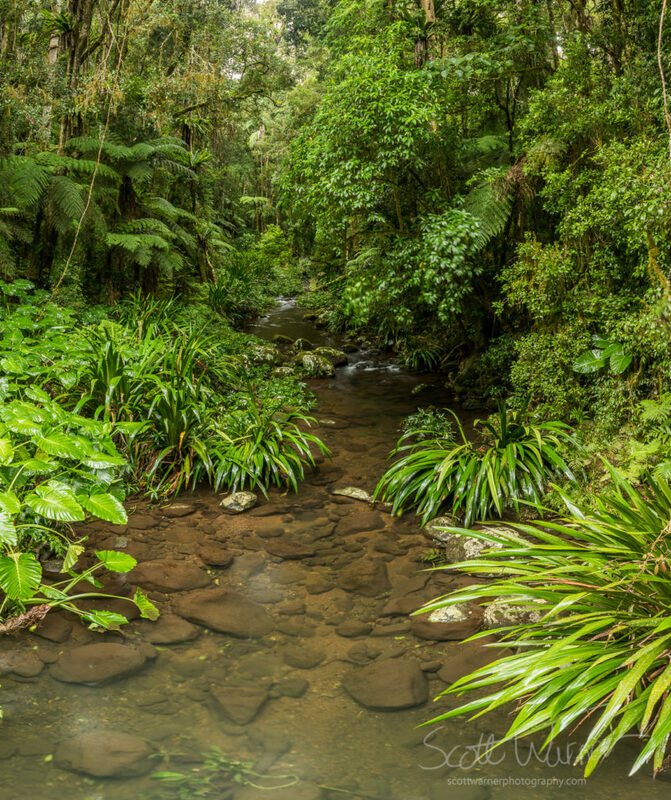 With the whole of the catchment for the creek within the national park, Brindle creek is a incredible crystal clear mountain creek which cascades through a green cathederal of rainforest. unappealing. After consulting the weather forecasts which predicted similar conditions for the next 2 days I decided that I needed to come up with a better option and it seemed that heading west was my only option for dry conditions. I decided to head to Sundown National park near Stanthorpe in Queensland which took about 3.5 hours and spend the rest of my week out there. 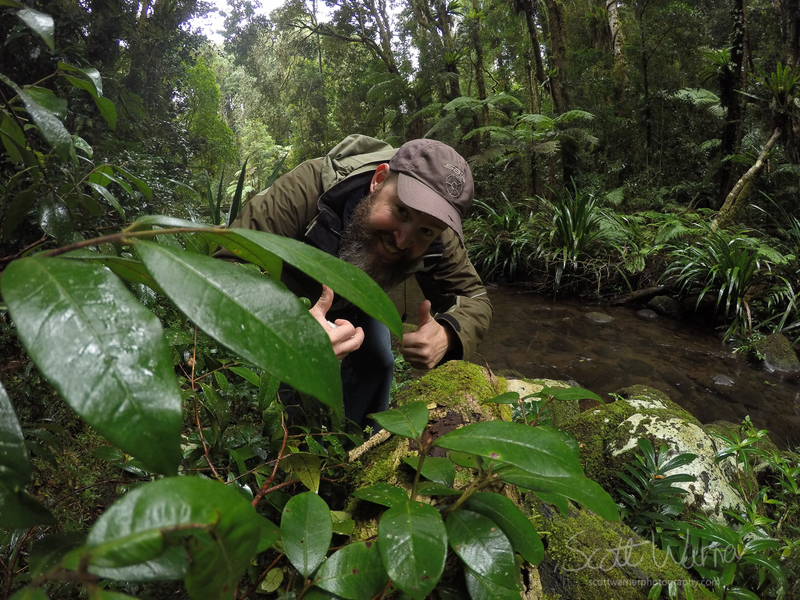 I will definately be looking to head back to the Border Ranges as there are some truly spectacular wild places to see and explore.